Mangroves are found in coastal tropical and subtropical areas and feature mangrove trees which are especially adapted to grow on brackish water of the coastal area. 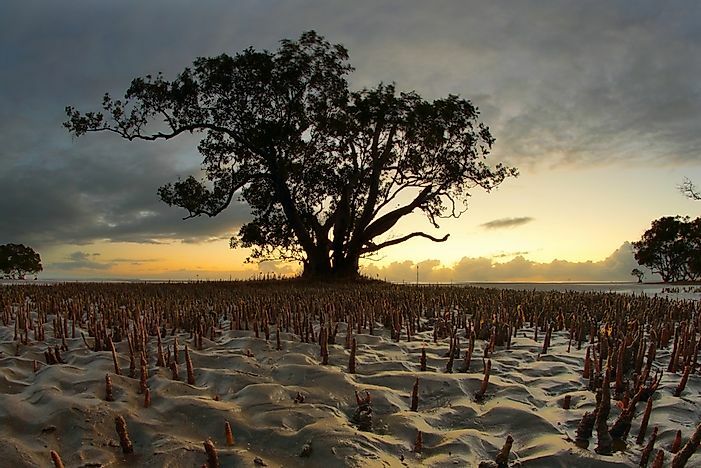 A mangrove tree is seen in Australia. Mangroves are special environmental habitats that consist of trees growing in nearly stagnant coastal waters, river banks and estuaries. These trees have exposed root systems that raise them above the surface of the water, often compared to stilts in appearance. Mangrove trees have adapted to the oxygen deficient soil and are able to extract the nutrients needed for survival. Additionally, these trees can survive in water with high salt content and in constantly changing water levels. This article takes a closer look at mangrove habitats around the world. Where Are Mangrove Habitats Found? Mangrove forests are considered hardy plants given their ability to survive in high saline waters and low-oxygen soils. Despite this hardiness, mangroves cannot withstand cold temperatures and can only be found in tropical and subtropical zones. Mangrove habitats cover a combined area of 52,300 square miles in the Americas, Africa, Australia, and Asia. Approximately 118 countries around the world hold a mangrove forest with the largest percentage located in Asia (42%). Africa has the next highest percentage (21%), followed by North and Central America (15%), Oceania (12%), and South America (11%). Around three-fourths of all mangroves are located within only 15 countries. Indonesia, for example, has the largest mangrove forest in the world, which covers a total area of just over 9,000 square miles. Healthy mangrove habitats are considered productive ecosystems that are beneficial to both marine and human lives. One of the most important roles that mangroves play environmentally is as a barrier between the mainland and the ocean. Given this unique location, these forests are often on the frontline of extreme ocean weather and storms. The dense root systems of mangrove habitats work to prevent erosion by slowing down incoming waves and by trapping sediment as it is carried off land and into the water. Not only does this help the land from disappearing, but it also prevents coral reefs from being covered in excess eroded material. Additionally, mangroves provide habitats to a number of fish, mollusk, and crustacean species. This abundance of life, along with the shelter provided by its roots, make mangroves an attractive ecoregion to migrating and breeding birds, tigers, monkeys, and crocodiles. A variety of plant species grow here as well, including orchids, which attract large numbers of honey bees. As previously mentioned, mangrove habitats are also important to humans as a source of timber, fishing, and tourism. Because wood from mangrove forests is resistant to insects and rotting, it is extremely valuable to the timber industry. Local communities also rely on mangroves as a source of building materials, cooking and heating fuel, animal food, and medicinal plants. As nursery habitats for a number of commercial fish species, mangroves help sustain fish populations from being overexploited. Research has shown that a large number of fish species rely on mangroves for survival: 133 species in Queensland of Australia, 128 in the Philippines, 119 in Malaysia, 83 in Kenya, and 59 in Puerto Rico. It is estimated that around 75% of the game fish and 90% of the commercial fish from South Florida in the US rely on mangroves as well. Additionally, in Queensland, Australia, around three-quarters of all commercially caught fish and prawns rely on mangroves for survival. Mangrove forests are also popular tourist attractions, which helps local economies grow by providing an additional source of income. Only a few countries around the world have promoted their mangroves for tourism purposes, however. Those that have offer snorkeling and boating tours so visitors can get a closer look at the wildlife living within the intricate root systems. Mangroves are one of the most threatened tropical and subtropical ecoregions in the world. In fact, around 35% of mangrove habitats have already been destroyed. In India, the Philippines, and Vietnam, that number is 50%. Mangroves are being cut down faster than rainforests in the Americas as well. These forests are often cleared to make arable land for agricultural purposes as well as to make room for urban development projects. As previously mentioned, the wood here is also valuable to the timber industry, which leads to overharvesting. When the trees are cut down too quickly, they are unable to regrow, contributing to declining mangrove coverage. Energy infrastructure along rivers and other waterways has a detrimental effect on mangroves as well. Structures like dams prevent water from reaching the coastline, which causes the salinity of the estuary to increase beyond tolerable levels. Deforestation that occurs further inland leads to increased erosion and settlement that makes its way to mangrove forests, effectively burying the root systems here. Climate change and pollution are also major threats to the health of mangrove habitats. Pollution from urban areas and the fertilizers and pesticides from agricultural lands often wash down rivers and concentrate in mangroves. This has a negative impact on both the trees and the other flora and fauna living in these ecosystems. Climate change has contributed to rising sea levels around the world, which disturbs mangrove habitat health as well. These ecoregions need relatively stable water levels to survive. In recognition of the importance of mangrove habitats, international nonprofits, governments, and communities have come together to work toward conserving and restoring these unique ecosystems. Approximately 20 countries around the world have begun restoration projects by replanting mangrove trees. Additionally, a number of international treaties and agreements have addressed the protection and aforrestation of mangrove habitats. One example of this is the Ramsar Convention, which has 110 member countries and works to provide an extra level of protection to wetland ecosystem (including mangroves). Under this agreement, around 250 mangroves have been designated as official Ramsar sites. Other conservation efforts include the Marine Protected Areas designation. Around the world, approximately 685 Marine Protected Areas include mangrove habitats, belonging to 73 countries and territories. These areas are protected by local, national, and international authorities, which enforce fishing limits and development and exploitation bans that have been established to protect the surrounding ecosystem. At a local level, management of mangroves is often challenged by a lack of government resources. Many areas around the world also lack knowledge about mangroves and their environmental importance. To combat this, many organizations have begun public education initiatives in conjunction with restoration efforts. What Is The Difference Between A Biotope And A Habitat? What Is A Monotypic Habitat?